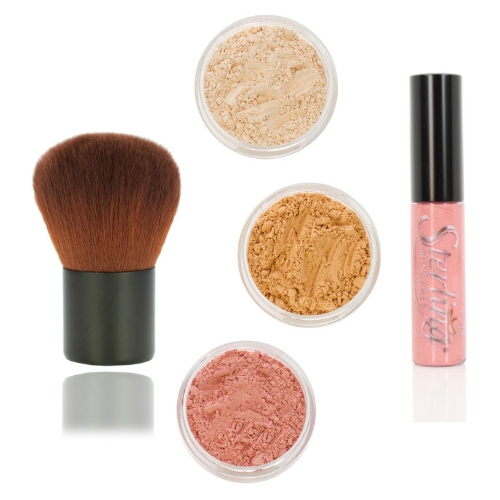 Do You Offer Mineral Makeup Starter Kits? Mineral Makeup Starter Kits Are Here! We are excited to announce that we love the idea of incorporating mineral makeup kits into our shopping cart for your convenience. Originally we wanted women to be able to personalize their products and most mineral makeup starter kits offered did not provide this. However, after doing further research and listening to our customers we have decided to update our services to meet the demand by those that very much prefer these when starting out with mineral makeup products. Main points for deciding to include mineral makeup starter kits: With our latest shopping cart upgrades we can now provide you with a choice. Diverse skin tones are available for your color range and you have the ability to customize your selection choosing from a variety of mineral makeup kits. This essentially allows you to enjoy a variety of products at a special introductory price. In our main mineral foundation kits, we have provided two shades of foundation which includes your choice of 3 different formulas, enabling you to create a customized foundation shade. Our mineral foundation shades are as diverse in color as skin tones can be. They include golden, beige to pinkish colors which you find in conventional starter kits by other brands, but we also provide shades of different olives, varying shades of yellow to golden, neutral, cool chocolate, reddish and golden bronze, caramel, ivory, peach, etc. This is perfect for getting the best skin tone match. Color and skin type are the premise of our success with assisting women to get it right the easy way instead of feeling frustrated or restricted to a limited range of colors that are in prepackaged makeup kits in the name of convenience. We continue with ongoing education for women of all ages, and provide caring customer service ready to further assist women whenever necessary to find that perfect match. Being able to mix and match is what makes mineral makeup work, and our starter kits offer diversity while other brands have narrowed the choices. Plus we still provide sample sizes in all our mineral makeup except for eye colors, for trial and error before purchasing your affordable mineral makeup starter kit. This is beneficial to women by avoiding the expense of purchasing full size minerals before learning their best shade choices. Women also have let us know how they have come to appreciate the fact that we will now provide both samples and starter kits, making their life that much easier, as will you! We are standing by to be of assistance to you with your first purchase of our beautiful mineral makeup shades.